Description:AJT Mud tank can be square and cylinder type. The mud tank will be configured completely with electrical control, lighting, guard rail, necessary pipeline, inlet&output, clean gate, etc. AJT Mud tanks is the main container holding well drilling fluid. It is widely used in oil and gas drilling, HDD, CSM drilling, slurry separation, tunnelling and mining industries. 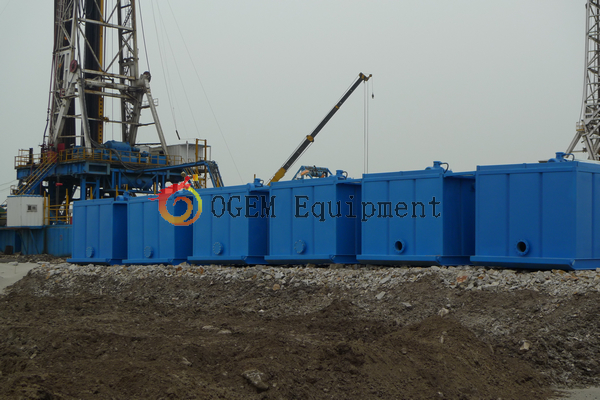 In OGEM equipment you can get ideal design on mud tanks. We’ll consider complete mud tanks system configuration. Such as proper space and position for shale shaker, mud cleaner, centrifuge decanter, mud mixing hopper, centrifugal pumps, etc. So we have shaker tank, suction tank, mixing tank terms. Please feel free to contact us for more information.